Although the manufacturer doesn’t have a website, North 49 products are available online from several retailers. 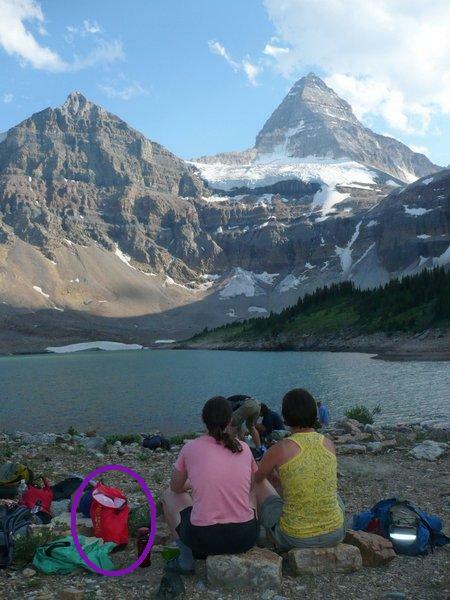 In Canada, I find North 49 products at retailers carrying basic camping gear and accessories. The information above about other sizes available came from in-store packaging observations as well as online retailers. The North 49 Ultra Lite Dry Sac is made of a lightweight nylon fabric. The seams are taped for waterproofing. The bag has a round bottom, so when packed the bag forms a cylinder. The top of the bag has a stiffened strip, 2 cm (0.8 in) wide, and a sewn-in label with the North 49 logo and the size of the bag. Each end of the top strip has half of a buckle closure, and one side has a D-ring. The bag closes by rolling the top strip over and clipping the buckle together. The outside of the bag has screen-printed text which says “Ultra lite Dry Sac 13 L” and has the North 49 logo. Most of the screen printing on my bag has worn off. 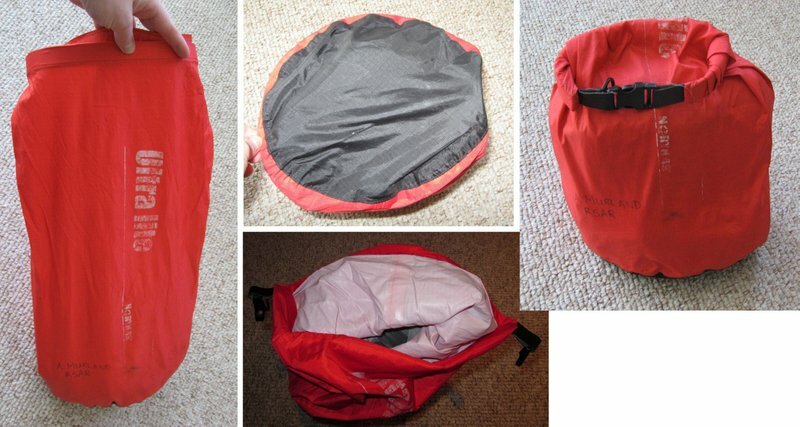 I purchased my Dry Sac in 2009 and immediately put it into use as an integral part of my search and rescue pack. I keep all of my essential gear in it that never changes when I grab my pack and go: spare clothes, fire starting materials, first aid kit, and some other odds and ends. In the three years that I’ve owned this bag, it has spent about 85% of its time packed, rolled, and in my pack. When I go backpacking, the Dry Sac becomes my food bag, and has been put in food caches and hung from cables, poles, and branches about fifteen times. The primary use of my Ultra Lite Dry Sac has been to keep my essential search and rescue gear dry, and although the bag has gotten wet from rain or snow soaking through my pack several times, the contents have never gotten wet. On one memorable occasion when I was travelling, I had laundry and some other odds and ends packed in the bag while flying home from a rock climbing trip, and the Dry Sac successfully contained a hairspray disaster (aerosol can + pressure change = leak) and prevented a spread of the mess to everything else in my luggage. As a food bag the Dry Sac is great. The size I have is sufficient for most trips I take, depending on how many people’s food I’m trying to stuff in it and how compact the food is, but in general I can squash everything I need in it. Once closed the bag is easy to hang either directly through the loop created by the roll top, or through the D-ring attached to the buckle. I find the Dry Sac quick and easy to use. I put all the contents in, squash them down, and then start to roll the top of the bag down before letting air back in. Occasionally it takes me two tries to get all the air out, but with three years of practice I’ve gotten quite proficient. The durability of my Dry Sac has been great. I thought when it got hairsprayed that it would deteriorate, but there is no visible damage to anything and it hasn’t leaked yet. The buckle closes securely, and there is just the odd loose thread showing. The screen printing on the outside is mostly worn off, but that doesn’t affect the function. The North 49 Ultra Lite Dry Sac is a lightweight, simple dry sack that has proved very useful in keeping my gear dry and my food hanging up at night. I hope it remains a part of my gear for a long time to come.